On Nov. 2, 2000, the Expedition 1 <http://www.nasa.gov/mission_pages/station/expeditions/expedition01/index.html> crew -- Commander William M. (Bill) Shepherd of NASA and Flight Engineer Sergei Krikalev and Soyuz Commander Yuri Gidzenko of Roscosmos -- arrived at the International Space Station <http://www.nasa.gov/centers/johnson/news/station/2000/iss00-48.html>, marking the start of an uninterrupted human presence on the orbiting laboratory. Their Soyuz capsule made contact with the aft docking port of the station's Zvezda Service Module at 3:21 a.m. CST while the two spacecraft were flying over the central portion of Kazakhstan. A little over one hour later at 4:23 a.m., the hatch leading into the Zvezda’s living quarters was opened, signifying the start of human occupancy of the international complex. Gidzenko and Krikalev floated into Zvezda first, at the request of the commander. Once inside the station, the crew members continued the work begun by space shuttle crews and ground controllers to bring the station to life. Fifteen years later <http://www.nasa.gov/mission_pages/station/research/news/infographic_15_years>, 45 crewed expeditions (so far) -- more than 220 people from 17 countries -- have visited the station, constructed over more than 115 space flights <http://www.nasa.gov/mission_pages/station/main/onthestation/facts_and_figures.html> conducted on five different types of launch vehicles. The station now measures 357 feet end-to-end and provides more livable room than a conventional six bedroom house. 22 scientific investigations were conducted during Expedition 1, while a total of 191 scientific investigations will be conducted during Expeditions 45 and 46. To date, more than 1,200 scientific results publications have been produced based on over 1,760 research investigations on the orbiting laboratory. 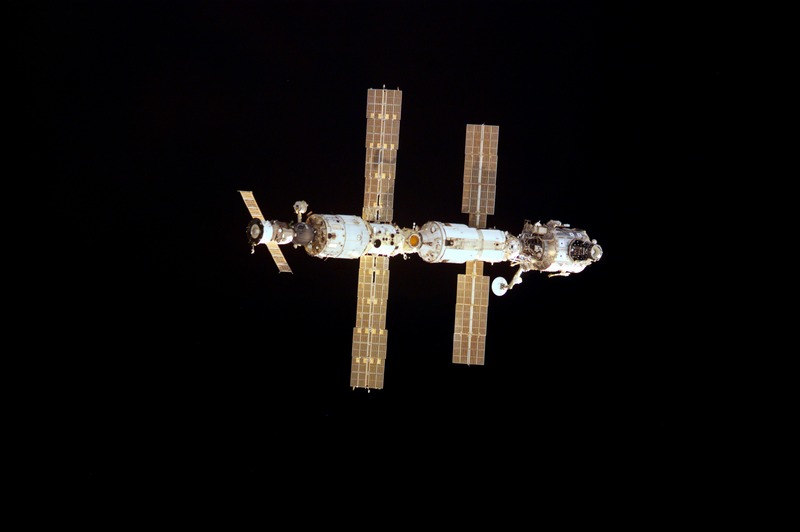 This Dec. 2, 2000, photograph shows the configuration of the space station at the start of Expedition 1 including the Zarya Control Module, Unity Node, Zvezda Service Module and Z1-Truss. It was taken by STS-97 <http://www.nasa.gov/mission_pages/shuttle/shuttlemissions/archives/sts-97.html> crewmembers aboard shuttle Endeavour during approach to dock with the station <http://www.nasa.gov/centers/johnson/news/shuttle/sts-97/STS-97-05.html> on a mission to deliver and connect the first set of U.S.-provided solar arrays, prepare a docking port for arrival of the U.S. Laboratory Destiny and perform additional station assembly tasks. The Expedition 1 crew spent four months living and working on the station and returned to Earth aboard shuttle Discovery <http://www.nasa.gov/centers/johnson/news/shuttle/sts-102/STS-102-27.html> on March 21, 2001. I think this is so interesting….inside the ISS at night when the lights are out…..
See the upcoming sighting opportunities for several thousand locations worldwide. NASA’s Spot The Station service gives you a list of upcoming sighting opportunities for thousands of locations worldwide, and will let you sign up to receive notices of opportunities in your email inbox or cell phone. The space station looks like a fast-moving plane in the sky, but it is dozens of times higher than any airplane and traveling thousands of miles an hour faster. It is bright enough that it can even be seen from the middle of a city! To learn more about the space station, its international crew, and how they live and working in space, please visit the space station mission pages <http://www.nasa.gov/mission_pages/station/>. Currently, 323,645 people are Spotting The Station. Receive email or text message notices hours before the station flies overhead. Sign Up <http://spotthestation.nasa.gov/index.cfm>Received an Alert code? Visit our Frequently Asked Questions <http://spotthestation.nasa.gov/faq.cfm>webpage. Go <http://spotthestation.nasa.gov/message_example.cfm>See what an average user might receive.